Will you bring honor to your family? Take a step inside the shoes of a ninja in the Silent Samurai Slot. Reels contain Asian style images such as geishas, ninja stars, and dragons. 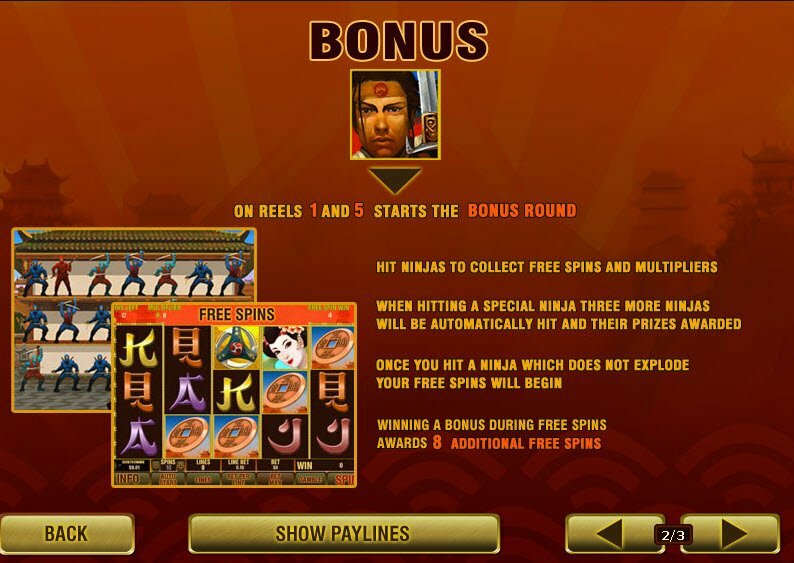 Lucky players who enter the Bonus Round will go up against ninjas to win Free Spins and Multipliers. 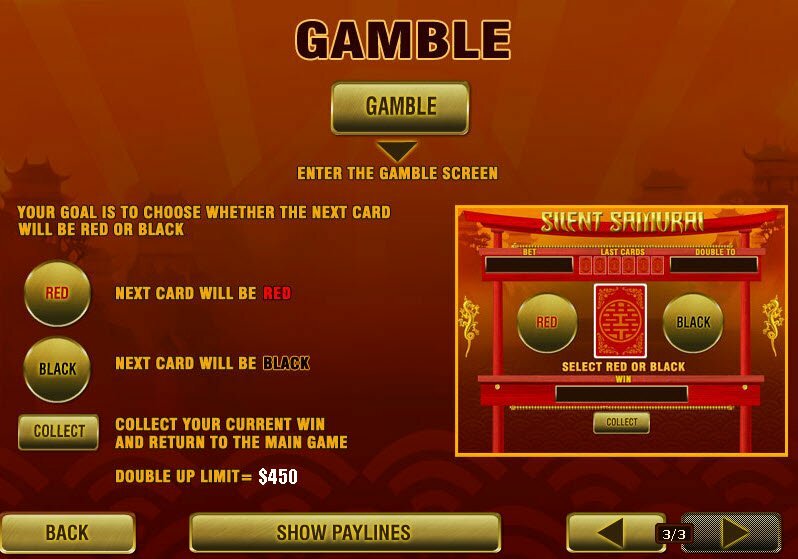 Designed by the Playtech gaming software, the Silent Samurai Slot features exotic graphics from the Far East. Although the game only contains 9 paylines, you have the chance to enter both a Bonus and Gamble Round. The beautifully designed Silent Samurai Slot may not have the most sophisticated graphics, but the images look artistic and exotic. The reels contain Asian style letters and numbers, dragons, geishas, and samurais. Meanwhile the reels contain embellishments in red and gold to go along with the theme. The Far East atmosphere makes this game interesting and unique. During the Bonus, three rows of ninjas appear on the screen. You must hit the masked warriors. For each one, you receive Free Spins and Multipliers. Silent Samurai Bonus Features keep the game exciting. The slot not only contains Wild and Scatter Symbols, but also awards players with a Bonus Round. If the Ninja Symbol appears on reels 1 and 5, you enter the Bonus Round. During the Bonus, three rows of ninjas appear on the screen. You must hit the masked warriors. For each one, you receive Free Spins and Multipliers. If you hit a special ninja, three more will automatically get hit as well which rewards more prizes. After you hit a ninja that does not explode, you collect and enter the Free Spins mode. If you win during this part of the game, you win 8 additional Free Spins. 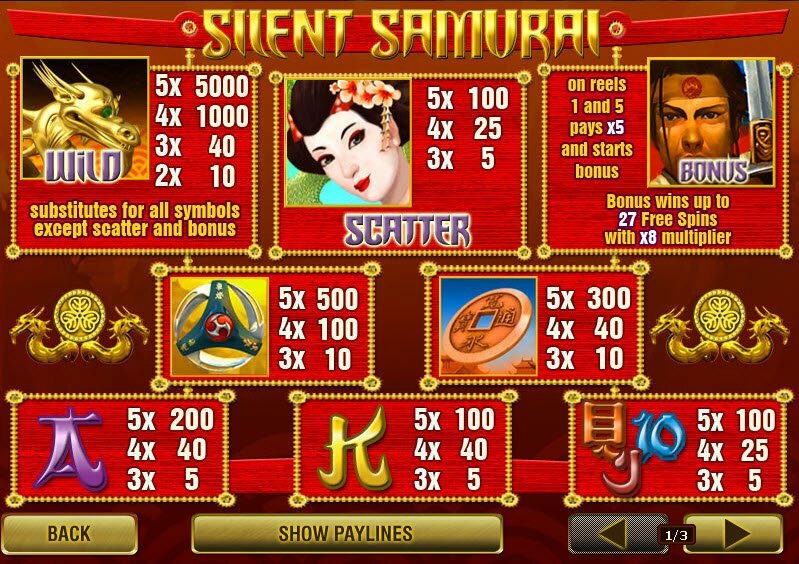 In addition to the Bonus Round, the Silent Samurai Slot contains a Gamble Round. After each winning combination, you have the choice to put your earnings on the line. Your goal is to determine whether the next card will turn out red or black.